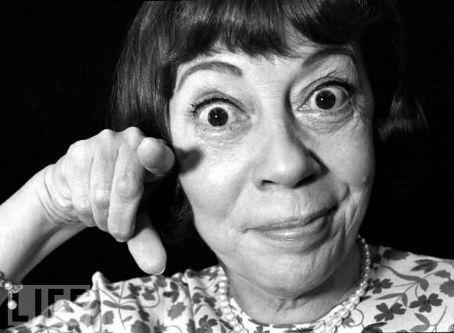 Today is the 109th birthday of Imogene Coca. There are a lot of people whose lives seem less remembered than others and less recognition is paid to their contributions than I feel is due to them. I am sure that is why I started the “Style Icon” tag in the first place: to remember and recognize the contributions that others made to society. Imogene Coca is one of the initial people I had in mind. She is just perfection. The world is a better place because she was in it and still feels the loss that she has left. LOCATION OF DEATH: Westport, Connecticut, U.S.
BEST KNOWN FOR: American comic actress best known for her role opposite Sid Caesar on Your Show of Shows. In addition to vaudeville, cabaret, theater and television, she appeared in film, voiced children’s cartoons and was even featured in an MTV video by a New Wave band, working well into her 80s. Twice a widow, Coca died in 2001. In 1995 she was honored with the second annual Women in Film Lucy Award, honoring women’s achievement in television and named after Lucille Ball.